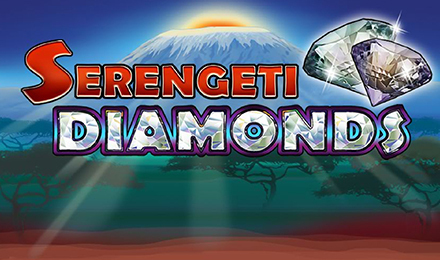 Explore the wild african bush on Serengeti Diamonds Slots! You can dig for big wins during its exciting Free Spins feature and Diamond Pick Bonus! Explore the African bushes and its wilderness on Serengeti Diamonds Slots by Lightning Box Games. This great 5 reels, 25 paylines African themed slot has a background of Mount Kilimanjaro. Get 2 or more glowing Diamonds on the reels to initiate the Diamond Pick Bonus. The Diamond symbols will freeze in their position and activate the Hold n Spins feature consisting of 3 spins. Get more diamonds on the reels to get extra spins during this feature! Five locked Diamonds on the reels will activate up to 10 Free Spins with a multiplier of up to 8x!